The claims were made by Bernadette Devlin (Bernadette McAliskey), who was then the MP for Mid-Ulster. The attack itself and Miss Devlin’s allegations against the police were the subject of a memo written by Inspector Bill Meharg, a senior RUC officer, and sent to Mr JE Greeves at the Ministry of Home Affairs in Belfast around six weeks after Burntollet. Meharg wrote: ‘It is entirely wrong for Miss Devlin to imply that the marchers were deliberately led by the police into an ambush at Burntollet. 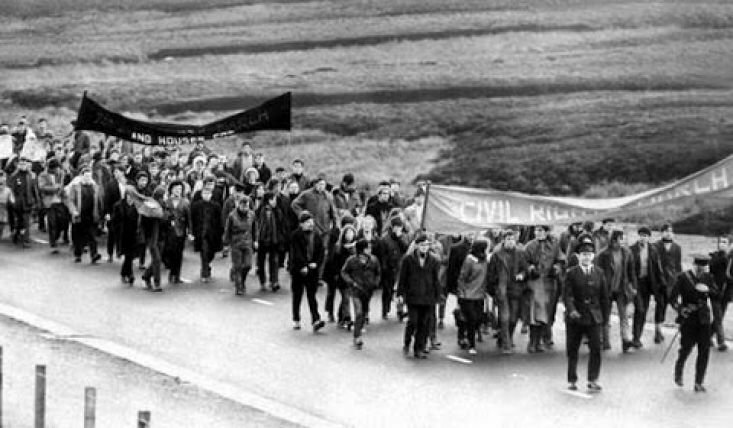 “The main organisers of the march were informed by the police before they reached Burntollet of the dangers they might encounter. Michael Farrell, one of the organisers, using a loud hailer, addressed the marchers and told them of the dangers ahead. “Notwithstanding this warning, it was unanimously agreed to continue the march as planned. At that time there would have been about six hundred in the march and it was evident that they were prepared to protest despite police warning. ‘Two police Land Rovers were in front of the procession. The occupants of both vehicles dismounted and took up position at the head of the parade. Police flanked the marchers on the left side. Other police were placed near the bridge and in a nearby field. A group of civilians, who were opposed to the marchers, attempted to block the roadway. There was no great strength in this group which broke up and dispersed as the police vehicles moved forward. “At this stage, police and marchers were subjected to a fusillade of missiles from counter-demonstrators who occupied fields on the right hand side of the marchers. The front of the parade got through without difficulty. The weight of the attack increased considerably. However, speaking about her recollections of the events surrounding the People’s Democracy march Bernadette McAliskey later wrote: “And then we came to Burntollet Bridge, and from lanes at each side of the road a curtain of bricks and boulders and bottles brought the march to a halt. “From the lanes burst hordes of screaming people wielding planks of wood, bottles, laths, iron bars, crowbars, cudgels studded with nails, and they waded into the march beating the hell out of everybody. “I was a very clever girl; cowardice makes you clever. Before this onslaught, our heads-down, arms-linked tactics were no use whatever, and people began to panic and run. Immediately my mind went back to Derry on October 5th and I remembered the uselessness of running. “As I stood there I could see a great big lump of flatwood, like a plank out of an orange-box, getting nearer and nearer my face, and there were two great nails sticking out of it. By a quick reflex action, my hand reached my face before the wood did, and immediate two nails went into the back of my hand. Just after that I was struck on the back of the knees with this bit of wood which had failed to get me in the face, and fell to the ground. “So I rolled up in a ball on the road, tucked my knees in, tucked my elbows in, and covered my face with one hand and the crown of my head with the other. Through my fingers, I could see legs standing round me: about six people were busily involved in trying to beat me into the ground, and I could feel dull thuds landing on my back and head. Finally, these men muttered something incoherent about leaving that one, and tore off across the fields after somebody else. “When everything was quiet, and five seconds had gone by without my feeling anything, I decided it was time to take my head up. I had a wee peer round, ducked again as a passing Paisleyite threw a swipe at me, and then got up. “What had been a march was a shambles. The first few rows had managed to put a spurt on when the attack came, had got through the ambush and were safely up the road. The rest of us were all over the place. “The attackers were beating marchers into the ditches, and across the ditches into the river. People were being dragged half-conscious out of the river. Others were being pursued across the fields into the woods. Others had been trapped on the road and were being given a good hiding where they stood. Neither did the Cameron Report exonerate the RUC for some police actions in the aftermath of the arrival of the People’s Democracy march in Derry. The report said: “An apt illustration of this is found in the riot of January 3rd in Guildhall Square, Londonderry, which accompanied and followed Dr. Paisley’s meeting there. The situation was already one of tension and the People’s Democracy marchers were due in Londonderry the following day. “The presence of Dr. Paisley and Major Bunting in Londonderry on the preceding evening was no accidental coincidence but deliberate, and in the mind of any intelligent person – and of Dr. Paisley’s intelligence, experience and capacity there is no doubt – such a meeting as he called on such an occasion would in all probability provoke sectarian reaction with consequent risk of riot. “This, as could have been expected, is precisely what happened, and the political temperature for the following day was thereby considerably heightened. A very ugly riot ensued in which considerable material damage was caused, and the police were put at strain to restore some semblance of order. “It should be noted also that (1) no members or supporters of the People s Democracy were involved in this riot or its promotion and (2) the stewards of the Derry Citizens Action Committee were active in their efforts to assist the police and keep the rioters from attacking the supporters of Dr. Paisley in the Guildhall. “In the serious rioting which followed the attacks on the People’s Democracy marchers at Burntollet Bridge and in Irish Street the actions of some of the more politically extreme elements in the People’s Democracy movement present in Londonderry by encouraging the building of barricades against the police helped to make an already dangerous situation more dangerous. “We have to record with regret that our investigations have led us to the unhesitating conclusion that on the night of 4th/ 5th January a number of policemen were guilty of misconduct which involved assault and battery, malicious damage to property in streets in the predominantly Catholic Bogside area giving reasonable cause for apprehension of personal injury among other innocent inhabitants, and the use of provocative sectarian and political slogans. “While we fully realize that the police had been working without adequate relief or rest for long hours, and were under great stress, we are afraid that not only do we find these allegations of misconduct are substantiated, but that for such conduct among members of a disciplined and well – led force there can be no acceptable justification or excuse. We have also considered the full and careful Report of County Inspector Baillie which has been made available to us (and whose evidence we heard) and we note, with some satisfaction, though with regret, that his independent investigation has led him to reach the same conclusions as to the gravity and nature of the misconduct as those at which we have arrived in our consideration of the evidence before us.